Our design concept for KASA began with the exploration of what it means to be deeply rooted in Hong Kong culture. Ideas of Cha Chaan Teng, wet markets, and neon light filled streetscapes immediately came to mind. Cha chaan tengs are local diners where Hong Kongers satisfy their appetites with indigenous comfort foods. These establishments helped shape the vernacular architecture of Hong Kong. Since freshness is a quality the client wanted to convey to his patrons, we selected pendant lights that pay homage to the ones that are commonly found in the wet markets of Hong Kong. Wet markets are a big part of the culture and are the epitome of what it means to be fresh – daily catches and freshly picked greens are on display every day. The lights are a subtle detail, but one that we hope will trigger one to recollect the familiar. Neon signs populate Hong Kong’s streetscape and these twisted, glowing glass tubes have become part of Hong Kong’s DNA. Drawing inspiration from the streets, we introduced a LED sign that floats over the kitchen that reads “healthy eating” in Chinese. The design process mandated us to question what is fundamentally cha chaan teng. Booth seating, mirrors, and tiled walls and floors were reoccurring elements that give these institutions their charm and character. We began with the typical cha chaan teng tiles, which came in selected colors only. 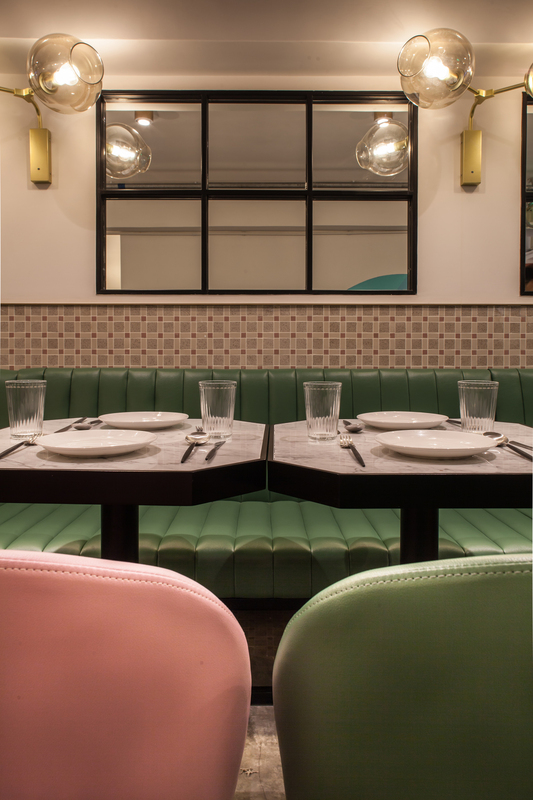 As a result, the color palette for the restaurant was derived through the tiles – green and pink. The colors help reinforce the ideas of freshness and youth. Since both Lim and Lu were born and raised in the East, educated and practiced in the West, a balance of both cultures is vital to us and always translated to our design. We wanted to bring KASA’s fusion cuisine concept into the interiors and allow the design to be a personification of the menu. This is done with the juxtaposition of contrasting materials and design elements, through pairing materials that are typically used in Chinese restaurants with elements found in Western dining rooms – the crude mosaic tiles with refined marble. KASA’s primary focus is serving the busy lunch crowd by serving food that can be easily consumed on the go. To support this concept, we maximized the storefront by implementing completely collapsible folding doors. As a result, the restaurant becomes an extension of the street. Upon entry, one is met with what seems to be another building façade where windows allow voyeurism from above – blurring the lines between interior and exterior.